Meghalaya is a wonder. In the western corner of North East India it’s rolling hills are silent, a welcome contrast to the busy dustbowl that is Guwahati (in Assam) where most visitors begin their journey. Even the small town of Shillong has lost the romantic aura of a hillside town, now packed with merchants who yell out their wares from rickety wooden carts at the crack of dawn waking everyone in their path. 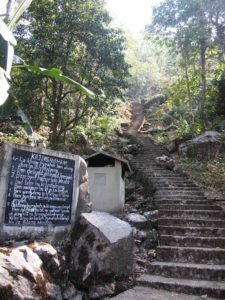 But Meghalaya, and much of the North East, is not about the places people congregate but rather about where they disappear, melting into the scenery. Nowhere is this meshing of nature and humans more evident than in Cherrapunjee, home to the impressive root bridges of Meghalaya. 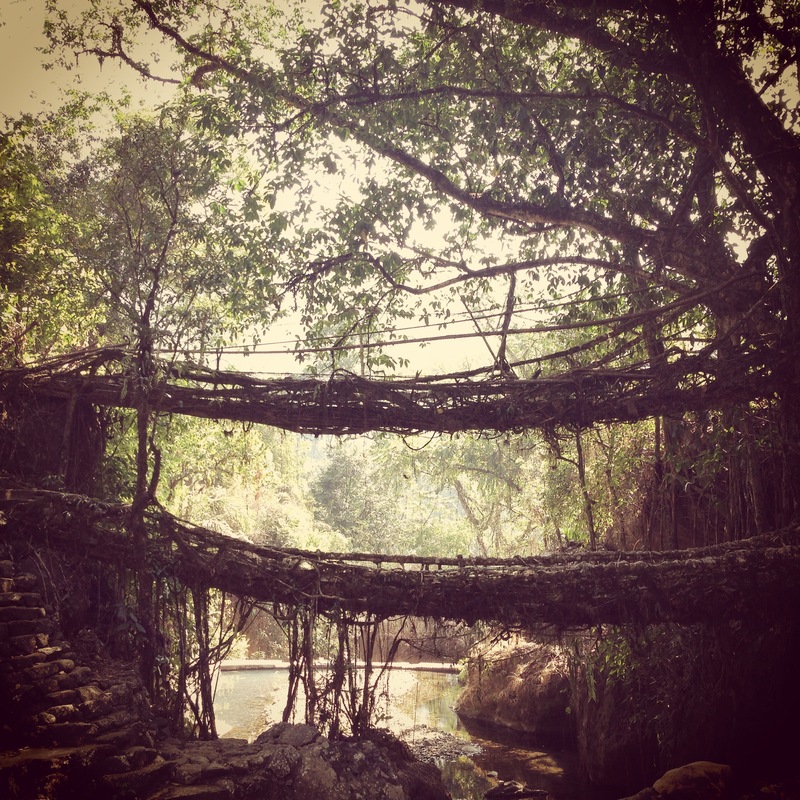 A creation of the local Khasi tribe, the bridges are created from the tangled roots of the Indian rubber tree (known as ficus elastica) and have been used for centuries to enable easy passage for local traffic. 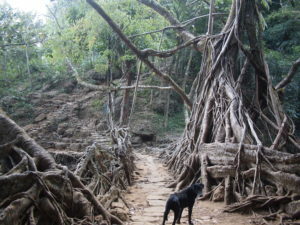 The root bridges were created as a matter of necessity to combat the climatic conditions of the region; Cherrapunjee is one of the wettest places on earth. The damp weather caused havoc and danger for traditional bridge structures made of wooden planks, so the Khasi tribe created their own solution through ingenuity and invention. They “trained” the tree roots, using hollowed out betel nut tree trunks as guides, to cross over river beds, finally replanting themselves on the other side to strengthen their hold. These bridges continue to grow and become hardier over the time as they are made from an actual living tree. A bridge can take over 15 years to form and can hold up to 50 adults, and it is estimated that they can live for five centuries or more undisturbed. While the living root bridges of the East Khasi Hills are functional, it is the breathtaking beauty of both the bridge and the surrounding jungle that make a visit to this area worthwhile. 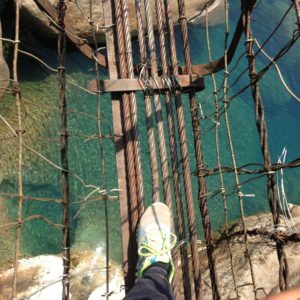 There are numerous living root bridges in the region, but the most famous is the Umshiang double-decker bridge. This striking two storey bridge is a feat of biological engineering, and is reached only on foot; a treacherous 2.5 hour hike into the jungle. Full of bravado I set out on the journey but was rather quickly brought crashing back to reality. Grappling with an irrational fear of heights, I looked down over hundreds of steps, each one like a ledge that led deep into the unknown. My rationale self calmly told me to just put one foot in front of the other and walk down the stairs like I did every day of my life. But like a devil perched on my shoulder, my fear paralysed me with visions of slipping and painful damage. Memories of many hours spent sitting at monuments around the world, unable to move as tears poured down my face, came flooding back. Every step I couldn’t take has left a hole in my adventures. I never saw the paws at Sigiriya because the slippery steps left me terrified to move. Hours were spent sitting on the large stone path that led to Machu Picchu as I contemplated through my tears whether I could get a donkey to carry me the rest of the way. And I saw the sunset over Bagan at the base of Shwesandan temple rather than from the peak, because I couldn’t bare the thought of having to climb down. As I pondered whether I could take the next step, my travel companion moved ahead with ease and grace. Turning briefly to see how I was, she sensed apprehension in my eyes and came running back. Taking my hand she calmly talked me down 3,000 steps and several swinging suspension bridges. For her patience I’m forever grateful. 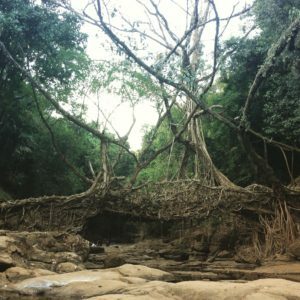 The double-decker root bridge is located on the flat and remarkably sturdy. With all fear pushed aside we wondered back and forth across and around it, viewing it’s spectacular beauty from all angles. And was the journey worth the mental torture and physical stress? Would I do it again? Perhaps not. Thankfully, there are several other living root bridges in the region that can be reached with less physical and mental stress. A case in point is the single storey Riwai bridge. Only a gentle 300 metre walk from the roadside, this is one of the oldest living root bridges, believed by some to have stood for over 3 centuries. The nearby village of Mawlynnong provides a good rest point. Once awarded the title of the Cleanest Village in Asia this quaint town with just under 100 homes is surprisingly spotless and the locals ever so friendly. Perched on a quiet hillside, just a short walk from town we found ourselves looking across to farmland in the neighbouring country of Bangladesh. I had finally found the end of India. Hi Rakhee, your posts are always so entertaining & informative. Thanks Leonie. It’s been a long time but I’ll hopefully post more regularly in the coming months.